I have read quite a few real wedding interviews this summer and have loved every one of them, but Laurie and Brian’s story truly captured my heart. My love for their wedding is partially due to the fact that their initial relationship, jokingly referred to as “work husband and wife,” that turned into a romance is simply so sweet. However, I am also completely smitten by this wedding because Laurie and Brian incorporated so many details that I dream of having in my own wedding someday, many years down the road! I have always wanted to design my own wedding dress, and the dress that Laurie created with the help of a custom dressmaker is stunning, if I do say so myself. Laurie and Brian have spent their fair share of time in banquet halls throughout their careers, so they wanted something different for their big day–an outdoor Southern wedding at Southwood House, surrounded by dripping Spanish moss, was the perfect contrast. Thanks so much to Cassidy Carson for sharing this charming day with us! P.S. We were thrilled to see that Laurie’s Southern Weddings Planner made an appearance in these photos! Can you spot it? Tell us about finding your wedding dress. The search for the perfect wedding dress was one of the biggest challenges. We had a fairly short engagement, so any dress ordered from a boutique would have to be rushed and leave no time for alterations. I never found “the” dress, and most of the time, left the bridal boutiques frustrated and overwhelmed. While searching Pinterest, I found a custom dressmaker located in Brian’s hometown, Salt Lake City. As luck would have it, we were visiting his family the upcoming weekend, so I quickly made an appointment with Penelope and the rest is history. I had the best time designing my dress, and within three weekend visits to Salt Lake City, I had my wedding gown! I love almost any arrangement of fresh flowers, so I had the hardest time settling on just a few types of flowers! I wanted the bouquets to feel whimsical, but not so loose that they competed with the draping Spanish moss and greenery around our venue. Ultimately, we decided on David Austin and garden roses, peonies, hydrangeas, and succulents, as a nod to our life in California. Did you decide to do a first look? Why or why not? We did do a first look. The majority of our guests traveled hundreds and thousands of miles to celebrate with us, and we wanted to soak up as much time with these friends as possible. Since most of our photos could be taken before the wedding, we decided a first look would allow for additional time to make this happen. Looking back, there are so many reasons to do a first look. Seeing each other before the ceremony calmed our nerves, and let us pray together and enjoy a few quiet moments before the celebration began! I love the theme song from Steel Magnolias and thought it would be a beautiful entrance for the bridesmaids. I searched high and low for a bridal processional, but never found a song better than the Steel Magnolias theme. Our talented string quartet created an arrangement that included a powerful crescendo for my grand entrance, and kept the song flowing until I made it to the end of the aisle. I think I had chills and tears the whole way. What readings, if any, did you have at your ceremony? One of my dearest childhood friends read 1 John 4:9-19. Her sweet pastor of a husband was our officiant, and together, they did an amazing job sharing the Lord’s meaning of marriage. What Southern details or traditions did you include in your celebration? 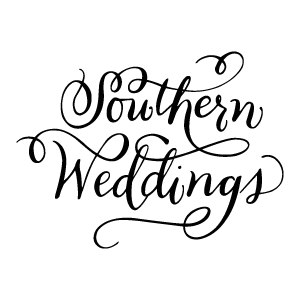 What was Southern about your wedding? The only non-Southern detail about our wedding was the groom! Our ceremony and reception took place under the Southern oaks, our wedding favors were jars of local Tupelo honey, our menu consisted of a biscuit bar, fried chicken, macaroni and cheese, shrimp and grits, and banana pudding, and my family provided the sweetest Southern accents to the evening! With careers in corporate America, Brian and I have attended our fair share of events in banquet halls and ballrooms. We wanted the feel and ambiance of our wedding to be completely different. Since my family lives in North Florida, we decided a Southern wedding would be best. Our dream wedding included a ceremony under the oak trees and a family-style dinner, served as if you were at a backyard garden party. When we discovered Tallahassee’s Southwood House and Cottages, we knew it was a perfect fit. The property is filled with giant oak trees and provided plenty of room to host both our ceremony and reception. There is a beautiful, historic home located on the property that we used to host our cocktail hour (and provide a cool haven for our guests). Describe your wedding cake and dessert. We both love traditional yellow cake with buttercream frosting, so this decision was easy! The best compliment was when our photographer remarked, “That’s the best piece of wedding cake I’ve ever had. And that’s say somethin’.” We also served banana pudding for dessert, as well as chicken and waffles and chocolate-covered strawberries for late-night bites. We have so many fond memories of our special day, but one that stands out is a sweet moment during the reception. Before the wedding, we decided to make sure we spent as much time on the dance floor as possible. We knew guests would follow our lead, and we wanted everyone to have a good time! At one point in the evening, I noticed that the dance floor was not packed, and I immediately felt the need to get the party going again. But then I took a moment to look around and soak it all in, and it was the prettiest sight! I saw our friends and family chatting away, enjoying their desserts, and socializing with old and new friends. Everyone seemed so genuinely happy to be celebrating with us–it was exactly what I dreamed for our wedding day! How did y’all meet? Tell us your love story. Brian and I met while working as consultants for a Los Angeles media and entertainment company. Over two years of traveling and working together, we became close friends. In fact, our coworkers joked that we were “work husband and wife!” After finishing our consulting project and no longer seeing each other every day, we both made an effort to keep hanging out. It was not long before we realized our friendship was the foundation for something more. Overall, I am pretty open-minded; however, three of the things I’ve always said I’d never do included living in LA, dating a guy that has the same occupation as me, and specifically, dating a guy as boring as Brian James. As each of these things became very true, I am convinced God has a great sense of humor. Luckily, I realized Brian is not as boring as I had originally thought–in fact, I kind of think he’s the best! Tell us all about the proposal! From Brian: I really wanted the proposal to be a surprise. We had spent plenty of time discussing marriage in the months leading up to the proposal, so any sign of a plan would be an absolute giveaway. To keep the element of surprise possible, I did not make any plans that would seem out of the ordinary. We went on one of our favorite hikes in the Santa Monica Mountains. From the top, there is an amazing view of the Pacific Ocean and the beaches of Malibu–it’s definitely one of our favorite places in the world. No other place seemed more appropriate to drop to a knee and ask Laurie if we could spend the rest of our lives together. We followed the hike with drinks at a beachside restaurant to privately celebrate before letting our family and friends know the good news! Did you have something borrowed, blue, old, and new? If so, do tell! My something borrowed and old was the Bible my dad gave my mom when they were dating. My something blue was a gold ring with an aquamarine stone gifted to me by my two older sisters. The ring was a Christmas present I received during middle school–it was the “real” (in other words, not from Claire’s) piece of jewelry I owned. My wedding dress, shoes, earrings, and bracelet were all new. How did you plan for your marriage while planning your wedding? In the months before our wedding, we both read through “The Meaning of Marriage” by Tim Keller. We had individually read it before our engagement, but reading it again together allowed us to talk through the key points of the Lord’s purpose for marriage and what story we want our marriage to tell. What was the biggest challenge you had to overcome while planning your wedding? Planning a wedding in six months was a bigger challenge than I had originally expected. Several venues and vendors we inquired with were already booked. However, the biggest challenge turned out to be the wedding dress and bridesmaid dresses. Every bridal boutique gave their “shock face” when I told them our wedding date. Luckily, we found a dressmaker who was able to make a gown in a short amount of time, and J.Crew had gorgeous options for bridesmaids dresses (and great sales, too!). What is the one detail or vendor that you were so happy to have as a part of your wedding? We adore our photographer and were so grateful to have her as a part of our wedding! Since we live in California and she lives in Tennessee, we were pretty sure we would not meet until the day of the wedding. Luckily, Cassidy made a trip to Southern California with her husband to visit family, and we decided to meet for an engagement photo session and dinner in Malibu. It was love at first sight! Cassidy has the ability to make you feel at home as soon as you meet her, a perfect character trait for a wedding photographer. Our photos are filled with natural smiles and laughs because we felt so comfortable with Cassidy snapping away on our wedding day. What advice do you have for folks currently planning a wedding? There are so many decisions involved that, at some point, the wedding planning will become overwhelming. On the days when it seems less enjoyable, step away and head out to do something fun. We spent time at the driving range, a great way to soak in some fresh air and forget the wedding planning woes. Also, never forget the real reason for the wedding–the beginning of your marriage. Even without flowers and a pretty dress, that is a beautiful thing! What’s next for you as a couple? What memories are you looking forward to making together? We are having the best time being newlyweds! We spend a lot of weekends traveling around the West coast and exploring this beautiful part of the country. While we definitely hope to start a family in the near future, right now, we are working on the stories for our grandkids! Perfect wedding cake love it! Thank you ladies for such a wonderful feature! Laurie and Brian’s wedding was definitely one of my favorites. And that moss!!! Beautiful people and a great set of photos! The whole wedding great. The kind of wedding little girls always dream of. AAA this looks so perfect it’s unreal. Someday i’ll have my dream wedding just like this lucky couple! Hi, are any of your bridesmaids looking to sell their dresses. I need 2 more of the heidi long dress in misty roses sizes (0,4 or 8) to complete my bridesmaids look.